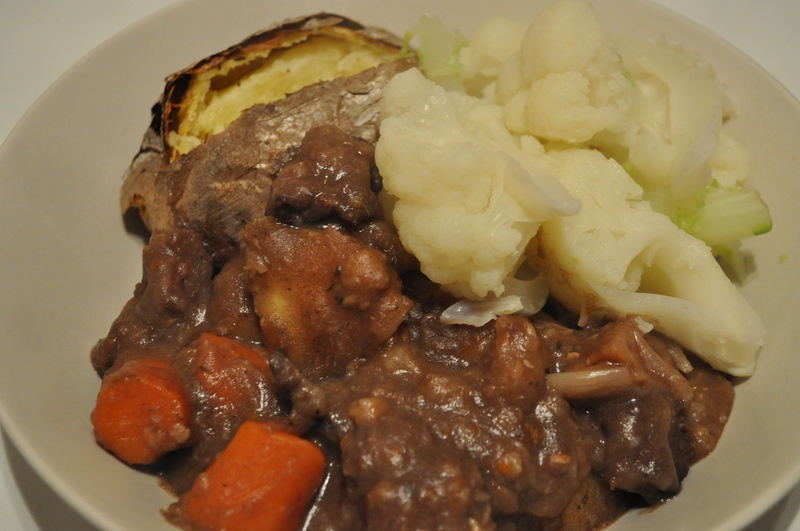 I made this meal a couple of weeks ago using some of venison that we were given by the local hunt. 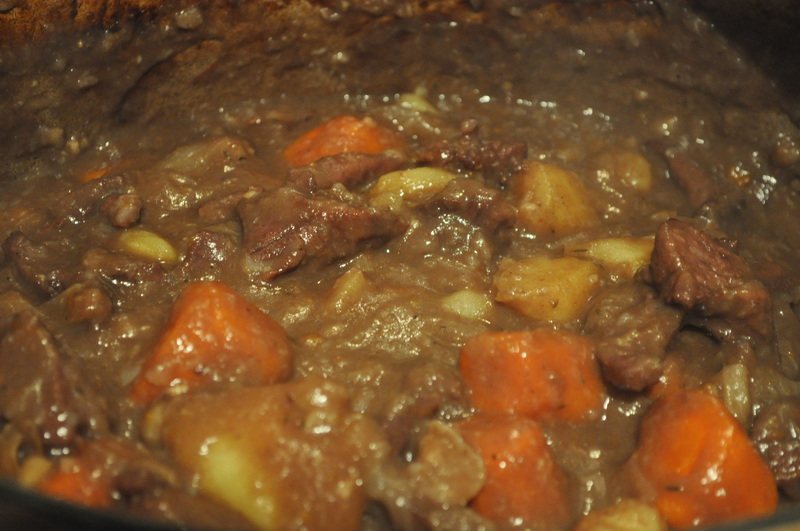 When I was last in England I brought back a selection of ciders and ales that I had wanted to try cooking with in various meals and venison cooked slowly in ale was one of the things I had wanted to try. The venison became beautifully tender and the ale gave the dish a slightly sweet taste. 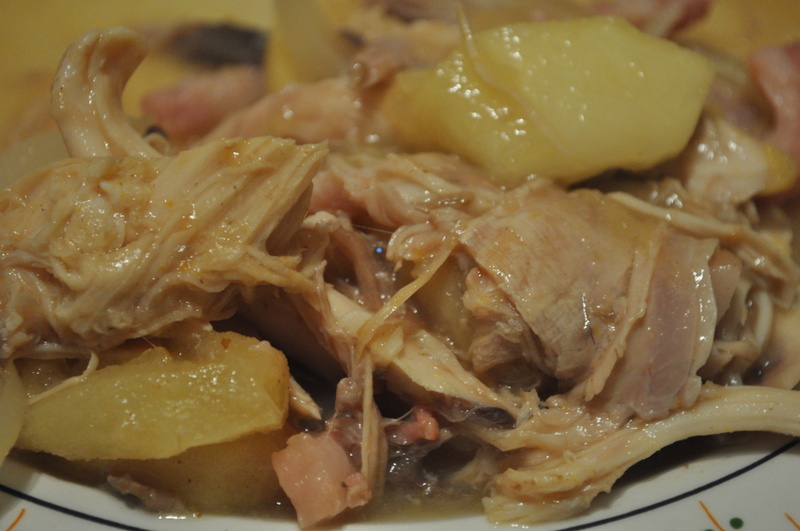 The one mistake I made when I cooked this dish was that I cut the pieces of potato and Jerusalem artichokes too small, so they broke up during cooking process – in future I will leave the artichokes whole and cut the potatoes into much larger pieces. 1. Place the sugar, butter, thyme, onions, shallots and garlic in a casserole dish – cook on a low heat for 10-15 minutes. 2. 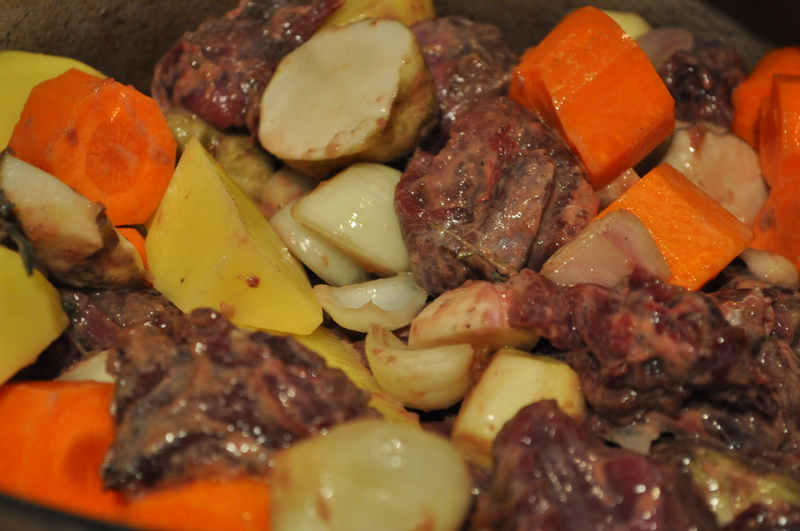 Flour and season the venison, then add to the casserole dish cook for 3-5 minutes on a high heat. 3. 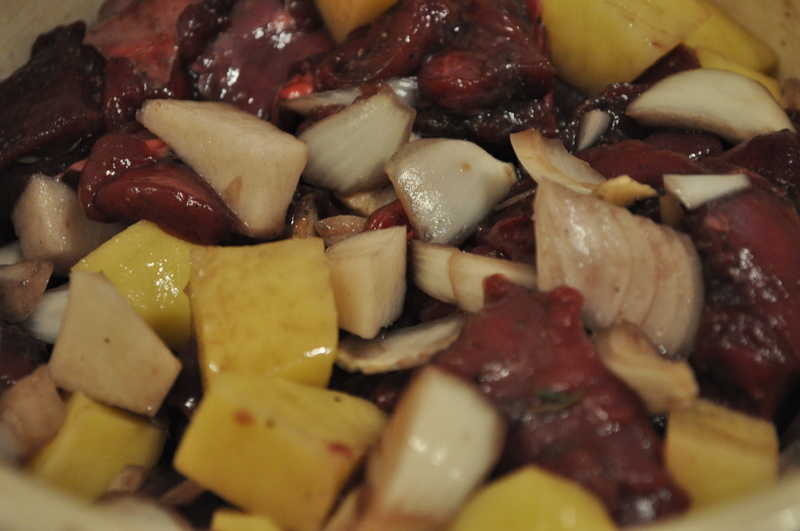 Add all the other ingredients, except the redcurrant jelly to the casserole dish, stir well and add a little water if necessary to ensure that the meat and vegetables are covered. 4. Place in the oven and cook at 160C fan for 2-2½hours. 5. Once cooked remove from the oven, taste and add a little redcurrant jelly as needed. Enjoy with vegetables of your choice! This entry was posted in drink, game, main meal, recipes, slow cooking and tagged game, instayum, lowandslow, recipes, seasonalfood, venison on November 19, 2012 by Antonia Cooks. This weekend a member of the hunt came over bearing a side of roe deer as a thank you for allowing them to shoot on our land; so on Monday it needed to be butchered into manageable pieces. After about an hour and a lot of knife sharpening I had a huge leg, a long slab of fillet, a kidney and about 2 ½ kilos of stewing meat packed away in freezer bags. You might be wondering where the shoulder went – as the deer was shot just behind the foreleg it meant there were bits of bone fragment and shot around the shoulder. Consequently, it was easier to clean and remove the bits of bone fragment from the shoulder by cutting it into stewing meat. In France they do not tend to hang meat (in general) for very long – in this instance the deer had not been hung at all! Therefore I was interested to see how it would affect the tenderness of the meat given that I was not going to be slow cooking it before putting it in the pastry. I was pleasantly surprised to find that the deer was not at all tough. What I must stress however, is that it is incredibly important to try and remove as much of the sinew, veins and membrane as you can before you cook the meat. This can be very time consuming, but it is worthwhile as it stops the meat becoming chewy or tough. 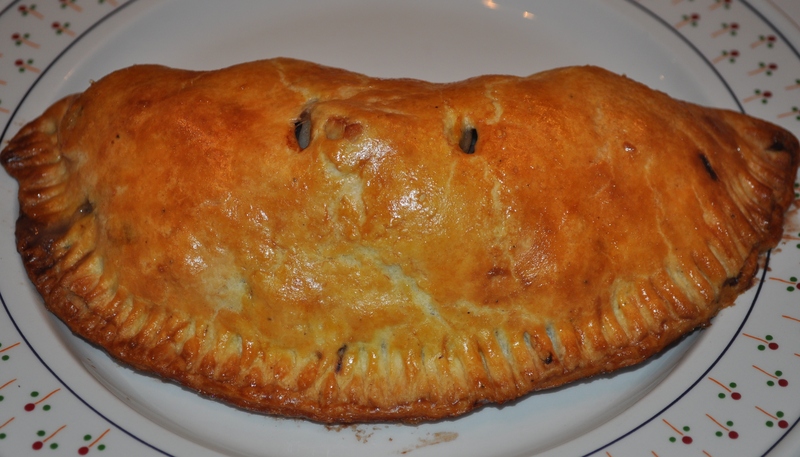 I decided to make some pasties using a little of the stewing meat and the kidney. 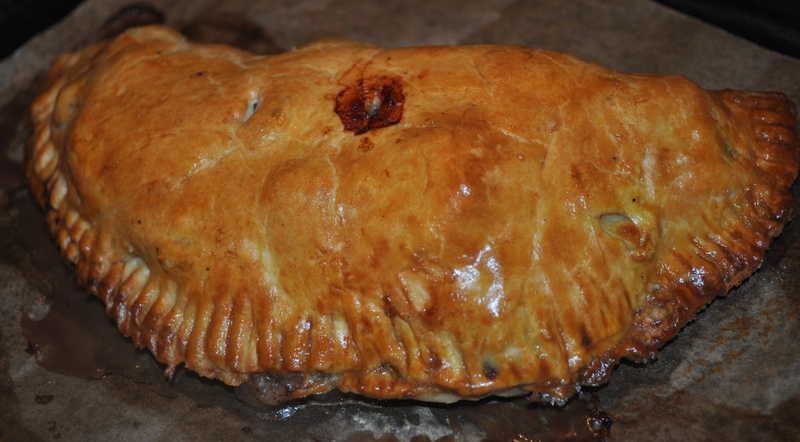 Last year I did a sailing course in Falmouth and it was there I discovered how comforting a good pasty can be – particularly after you had spent the entire day getting cold and wet on a boat. The thing that I noticed when I had tried them was the importance of good seasoning, as it can make or break a pasty, so don’t be shy about using a healthy amount of salt and pepper. 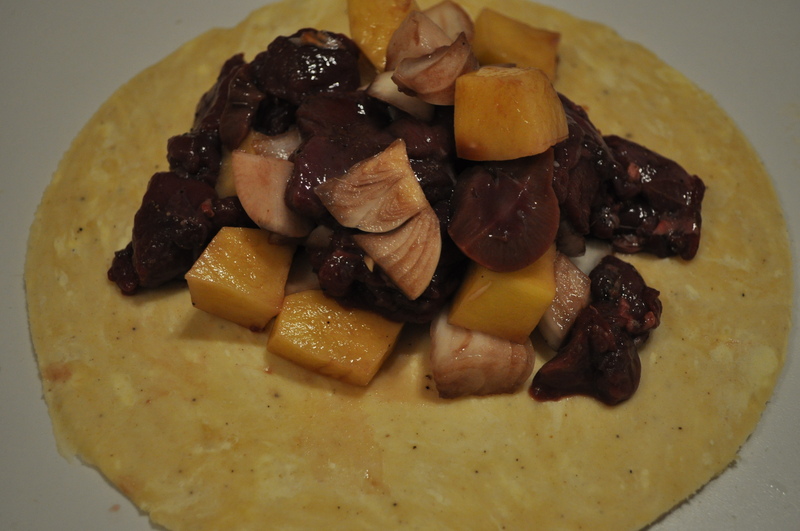 The recipe below would work well with beef or chicken if you can’t get your hands on some venison. If you fancy making it completely vegetarian just add some other vegetables in the place of the meat, for example carrots, spinach, butternut squash, Jerusalem artichokes, etc..
1. Firstly make the pastry – place the dry ingredients in a bowl. Cut the butter and margarine into cubes, add to the dry mix. 2. Using your fingers crumb together the mixture (don’t worry if you have a few small bits of butter that haven’t broken down). 3. Then add the water (a little bit at a time) until the pastry comes together and you can make a ball. Wrap the pastry in some cling-film and put in the fridge for at least 30 minutes. 4. Whilst the pastry is chilling prepare you’re your filling, by mixing all of the ingredients together in a bowl, cover with cling film and set to one side until you are ready to use it. 5.Once the pastry has been chilled, remove from the fridge cut into 3 equal sized pieces. Roll out each ball on a floured surface to your preferred thickness, then using a bowl/plate as a template cut out a circle roughly 20cm in diameter. 6. Divide the filling equally between each of the pastry circles. 7. Using a pastry brush, gently brush some of the beaten egg around the edge of the pastry to help it seal when you fold it over into a “D” shape. 8. Seal the pastry together first using your fingers and then take a fork and gently press down on the edges to form a crimped edge. 9. Finally, place the pasties on an oven tray that you have lined with greaseproof paper, brush the outside of the pasties with some of the egg wash and using a knife pierce the top of the pasties twice (this will allow the steam to escape whilst it is cooking). 10. 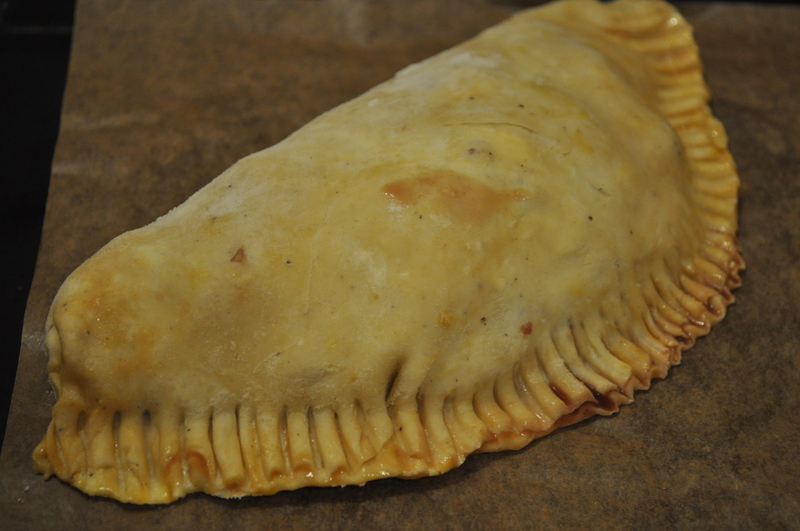 Place the pasties in an oven that you have preheated to 190C fan for 40-45 minutes. Serve. This entry was posted in baking, game, main meal, pastry, recipes, starter and tagged foodblogger, foodie, foodphotography, foodstagram, game, homecooking, recipes, seasonalfood on October 31, 2012 by Antonia Cooks. Living in France has opened my eyes to many things in terms of food – the most notable of which has been the versatility of rabbit. Growing up in England, the only rabbit that I had eaten was wild rabbit. Wild rabbit tends to look like a red meat that has a lovely gamey taste. In France the rabbit is different because they are reared for their meat much like chickens in the UK, subsequently their meat is white. It is a dream of my parents to become self-sufficient (if any of you have ever read John Seymour’s book The Concise guide to Self-sufficiency – you will know that if you are successful the only thing you should ever need to buy is salt). In terms of the production of fruit, vegetables, honey and meat my parents do pretty well. I am not sure they will every go the whole hog and plant wheat/barley in order for us to have our own flour but the possibility is there should they wish. One of their best producers is their rabbits. We have three breeding rabbits, Hop, Skip and Jump who have a maximum of two broods during the winter and spring months. In our experience the rabbits produce roughly 6-9 kittens (baby rabbits) each time, which means we get anywhere between, 24-36 rabbits each year for consumption. This makes rabbit a very economical animal to rear, particularly when one rabbit can comfortably feed 5-6 people. I am not going to pretend that the first time I was told that we were going to eat rabbit for supper I was a little sceptical. This is because my first pet was a huge white rabbit, called Snowy (I know it was a very original name). Once I got past the fact that I was not in fact eating Snowy but an animal that had been reared for eating and it not the type of animal you can pick up and cuddle, I was pleasantly surprised at how nice it tasted. 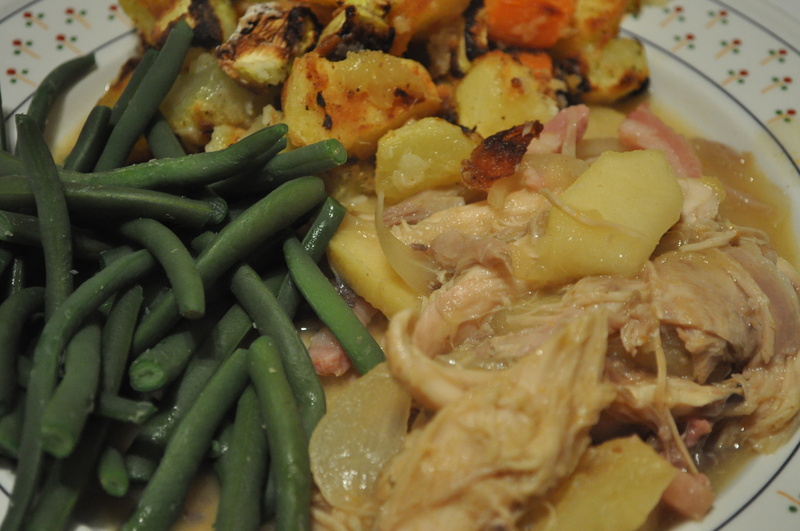 People often make a comparison between the taste of rabbit and chicken and it is probably the best way to describe the flavour. The meat to all intents and purposes is fairly bland, but it absorbs flavour wonderfully which makes it very good to cook with. I fully appreciate that rabbit is not for everyone, but I would definitely recommend everyone try it once. Yesterday I had some friends around for supper. When I asked them what meat they would like for supper they replied ‘rabbit’ because they don’t eat it that often and, when they do, it is wild. I have had an idea about how I wanted to try cooking it for some time with apple, cider and mustard and this presented me with a perfect opportunity. The meal does take quite a long time to make as initially you have to poach the rabbit very slowly in the oven. However it is certainly worth the effort. Preheat oven to 150C fan. Place the onions, garlic and oil in a large casserole dish, cook on a low heat until the onions are soft. Add the herbs, apples, carrots and rabbit to the pan. Pour over the stock until the rabbit is about ¾ covered. Bring to the boil, cover with a lid and then place in the oven for 2 hrs. Remove for the oven and leave to cool. Once cool, strip the meat off the rabbit and place in a bowl and pass the stock and vegetables through a sieve into a measuring jug so they are both ready to be used in stage 2. Add the lardons and the flour, stir together well. Gradually add in the stock and mustard and allow it to thicken, stirring occasionally. 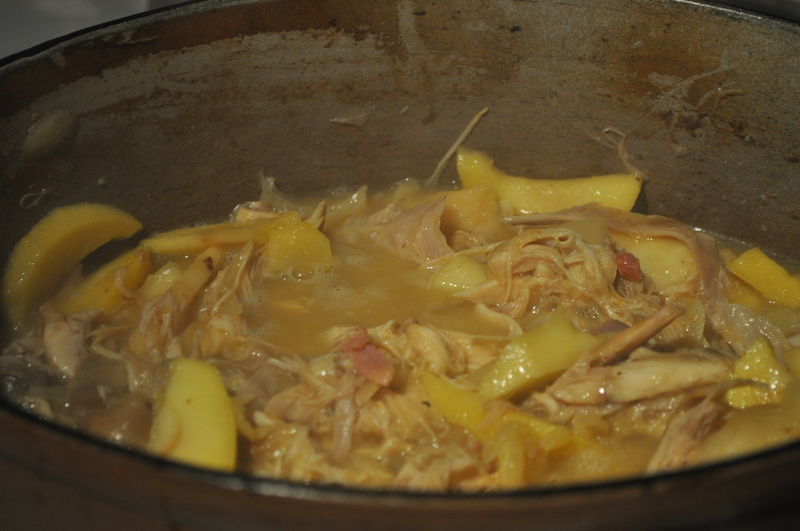 Add half of the cider, the meat from the rabbit and apples. Cover with a lid and leave to gently simmer for around 20-30 minutes. Add the remaining cider and cook for a further 5 minutes then taste and season as necessary before serving with green beans and mashed potatoes or roasted vegetables. This entry was posted in main meal, recipes, slow cooking and tagged foodblogger, foodie, france, game, homecooking, meat, rabbit, recipes on October 20, 2012 by Antonia Cooks.